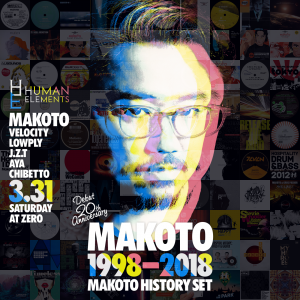 今回の Human Elements では、1998年のデビューから今年2018年で『デビュー20周年』を迎える Makoto が、自身のリリースしたオリジナル・リミックス・プロデュース曲のみをプレイする、スペシャルな “1998-2018 Makoto History Set” を披露する !! Long run musical / soulful Drum&Bass night in Tokyo – Human Elements. This time…Tokyo’s one & only Makoto will be playing “Makoto History Set” which he will be only playing his productions, as 2018 marks 20 years since his first release on Nexus Records (Good Looking’s sub label) in 1998. You can expect the sound of his past, present and future. The line up is going strong with Tokyo’s finest local acts, we have Velocity who is one of the best dnb acts in Tokyo and has been releasing his own music on Human Elements, Fokuz and many other labels and our amazing residents Lowply, JZT and Aya, also new comer Chibetto from Beginning is joining us this time. The tickets will go on sale on 12th Feb, don’t miss it.